Fires don’t just “break out”. Did anyone blame the Jews yet? Who needs historical cathedrals when you have the Quran already? 850 years old. Can French firefighters save this beautiful cathedral? At “best,” ALL the Cathedrals were taken over by the secular government, and their maintenance has been deliberately run into the ground ever since. It would take quite the “accident” to burn down a STONE structure. Do you have any evidence that Muslims are responsible for this? How did the church of St. Sulpice in Paris catch on fire last month? Why are all the synagogues in France under police guard? Why were 754 Christian churches vandalized in France last year? Why is this happening every day in Europe? More than 875 churches were targeted in France in the last year alone. In the last year alone. 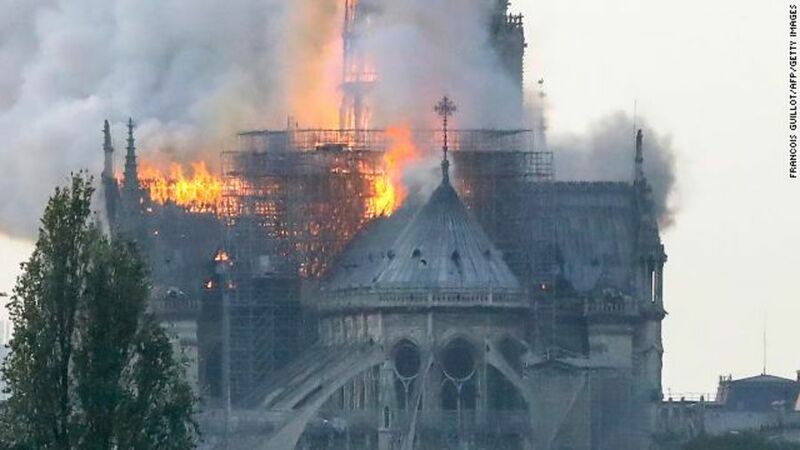 One of the most marvelous cathedrals in the world, Notre-Dame of Paris, an absolute jewel, has been destroyed! The cathedral didn’t implode. It didn’t set itself on fire. In 2016, 2 veiled Muslim women tried to detonate a car filled with explosives in front of Notre-Dame (https://en.wikipedia.org/wiki/Notre_Dame_Cathedral_bombing_attempt). At the beginning of March, an illegal Muslim immigrant tried to burn down the Saint-Sulpice church (http://www.leparisien.fr/paris-75/paris-l-incendie-a-l-eglise-saint-sulpice-n-etait-pas-accidentel-18-03-2019-8034678.php). At mid-March, an illegal Muslim immigrant tried to burn down the organ of the Saint-Denis basilica (another jewel) and destroyed stained glass (http://www.leparisien.fr/paris-75/paris-l-incendie-a-l-eglise-saint-sulpice-n-etait-pas-accidentel-18-03-2019-8034678.php). Macron is an absolute criminal, he supports the Muslim invaders who are slaughtering us and destroying our country ! Hollande will stay in history for the Muslim terrorist slaughter in the Bataclan (Novembre 2015), where Muslims beheaded and emasculated and eviscerated French men, women and children, according to the official report by the French National Assembly (http://www.assemblee-nationale.fr/14/cr-cemoyter/15-16/c1516011.asp , search “décapité”), and Macron will stay in history for the destruction of Notre-Dame by his beloved Muslim thugs. Where I live, absolutely everybody HATE Macron ! I am glad I got to visit Notre Dame in the late 1980s. That experience will never happen again for anyone no matter what new ‘replica’ they build there. The idea was they built such a magnificent building without the technology and machines of the modern age. A peplica will not be the same. At least much of the stone structures can be enshrined in the new structure. It was only a month ago that another historic church Saint Sulpice was set on fire. Funny, haven’t heard a word about that arson investigation. Why is no one in the media talking about the vandalism/arson wave hitting Christian institutions in France? We know the answer to that. What will be set on fire next? Castles in the Loire Valley? Any of the hundreds of museums in France? Eiffel Tower? WE can see the fiery future ahead for all of us? Islam is poison. But without self-hating leftopathic paranoid masochist libocrites to enable them, muslims aren’t even able to reliably use fire. With attendance and tithes down thanks to Popish communism, perhaps the church is tapping into insurance revenues to fund their priests’ lavish lifestyle entitlements?